I've cultivated a genuine love of Euro Truck Simulator 2, so while I've yet to get on board with Farming Simulator 2013, I understand why people enjoy pretending to do a job they don't do. With Farming Simulator 2013: Titanium, you can now pretend to do that job on a different continent. The American expansion brings new crops, new vehicles, and new dungarees. Note: game might not contain dungarees. "Inspired by typical American farms, this new and monumental terrain represents a total change of scene, with new locations, fresh development opportunities for your farm and even bigger fields suitable for the largest agricultural machinery available in the game." 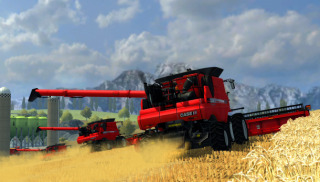 Farming Simulator 2013 owners can get the Titanium expansion right now. For everyone else, a Titanium Edition bundle has been released, providing both the game and its DLC. That's more simulated farming than you'll ever need. Or want.